Cara Hamann is a Faculty Associate in Epidemiology and the Injury Prevention Research Center at the University of Iowa. Her main research interests are transportation safety, injury epidemiology, vulnerable and high-risk road users (e.g., bicyclists, pedestrians, motorcyclists, and novice drivers), and global injury prevention. 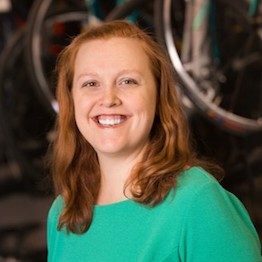 Her work includes studies of adult and child bicyclist risk exposure, examination of justice data on charges and convictions of drivers who have hit bicyclists or pedestrians, and use of virtual environments to study driver behavior. She is also involved in teen driver safety and child passenger restraint research and is active in outreach and advocacy related to vulnerable road user safety. She teaches courses in global road safety and epidemiological data management and analysis.